Students, staff, and faculty at UNB and STU are partnering with the UN accredited Foundation for Environmental Stewardship (FES) to host an exciting training opportunity for youth on Oct. 21. In celebration of Canada 150th, the Sustainable Development Goals Youth Training Canada aims to mobilize 10,000 Canadian youth to advocate and implement the goals through 100 local actions and 50 trainings in colleges and universities across Canada in 2017. The University of New Brunswick, St. Thomas University and student unions on both campuses are thrilled to collaborate on such an exciting opportunity for the community and its students by hosting one of two Atlantic training events. "The Student Union is incredibly excited to partner and support the UN-SDG initiative this year,” said Herbert Bempah, president of the UNB Student Union. 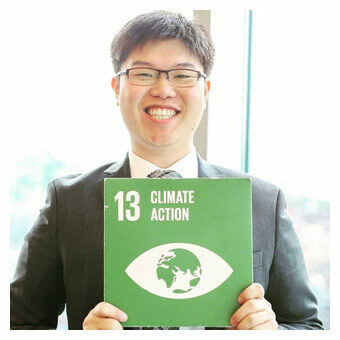 “As students, it is in our best interest to contribute to the conversation about solutions to world issues such as climate change, economic inequality, sustainable consumption, peace and justice." On Saturday, Oct. 21, local youth in high school and post-secondary institutions will attend a day of training focused on empowering youth to implement the 17 Sustainable Development Goals (SDGs) developed by the United Nations. The training will provide students with opportunities to interact with UN and Foundation for Environmental Stewardship officials, policymakers, faculty members, and community activists while they receive training in specific practical skills related to the sustainable development goals. Along with developing a deeper understanding of the goals and gaining practical skills, participants will be provided with lunch and receive a certificate acknowledging their completion of the training. “This kind of training is especially relevant for university students seeking to translate their studies to practical skills so they can transition into the workforce once they graduate,” said Dr. Carolyn Bassett, coordinator of UNB’s International Development Studies program. “The UN SDGs can be easily linked to pressing local issues here in New Brunswick: eliminate hunger, ensure quality education for everyone, make sure everybody, at every age, has a healthy life, sustainable cities and communities, and reduced inequalities. They are intended to inspire concrete local initiatives for the next 15 years, so the participation of youth will be especially important if we are to make progress towards these important goals,” Dr. Bassett said. Tickets are $20 and cover the training, certificate, and lunch. Register now. For more information, contact Tabatha Armstrong at engagearts@unb.ca or call (506) 453-4875.